After The Way the band was thinking about what would come next. We thought of material which would push the sound of the band forward, an album which we could project as a beginning for a future Anima Mundi sound. However the circumstances pressed us to make an album as fast as possible. This situation gave birth to The Lamplighter, a piece of work made essentially by using material, with a very symphonic flavor, written in the 90s to be played along with a symphonic orchestra. Nonetheless, the band felt and kept in mind that, after The Way Anima Mundi should built another kind of album. After finishing Tales Tour in 2014 and back in Cuba, we started to work on it. Some material was already written in our country early this year and we introduced it while touring specifically in the Netherlands and Germany; however, the biggest composition work took place in Havana between November and December 2014. The main musical ideas and concepts for lyrics were growing in my mind in this period including also the early 2015. By that time, I conceived kinds of harsh and maybe, in contrast, utopian lyrics for the album, which could become the first one of a trilogy. However, the album needed a name and we were looking for the right one but no name convinced us at all. Finally, Virginia suggested us an album title: I me myself. We all agreed with it afterwards. In January 2015, the band started rehearsing with José Manuel Govin on drums; however, in April, he quit due to health problems. He was suffering from tendon swelling in one arm and recovering could take long time. We had to replace our classic drummer for Marco Alonso. The rehearsals went on in May and new ideas came up for more than 3 month of hard and nonstop work. Then, we had more time to improve the arrangements and to add a bunch of fresh ideas. Finally, we began to record the drums in sessions in late August and finished these records one month later. We had to use a really small home studio in which we found ourselves in serious difficulties, especially because Marco hardly had space for himself due to his height. Anyway, having lack of budget, we should go farther and never look back. In November, the bass guitar was recorded and also electric guitars, these latter took us as well part of December. Saxophone, percussions, vocals and the acoustic guitars were recorded during January and February and the keyboards in this latter month although they also took part of March. We finally began the mixes in late February and early March; and the master was done by Kelle Wallner and Yogi Lang from RPWL at Die Farm studio, Freising, Germany, also during the 3rd month of this year. The fabulous artwork was made by Douwe Fledderus from Blissy Design who was working along the band in the album artwork concept from the very beginning. I me myself was released April the 28th, 2016. Musically speaking, I me myself portraits a musical speech similar to the aesthetic of Neo-Noir. The themes seem obscure and mix melancholic and lone melodies with dark atmospheres. There are also dropping guitar sounds surround claustrophobic ambiences where you can find melodies bouncing like different characters and there is as well a bittersweet feeling which makes one feels that no answers can be found. The material reaches its own goal with the presence of wide range of sonorities such as jazzy, metal, industrial, hard rock, folk ballad, psychedelic and symphonic. The album is composed of three epics songs plus three “short” ones. In I me myself songwriting, there is also a deep and strong rhythm session, dense and ethereal atmospheres and a more modern sonority than the previous Anima Mundi works as well. We though of an album that could also match and function during live performances with tight precision and be accompanied by a good show where the powerful, breathtaking and lyrical parts altogether, could lead the audience into our musical world. I me myself is a kind of reflection about humankind. It is, by far, the most obscure Anima Mundi album so far and more eclectic than all the Anima Mundi previous works. It is a conceptual piece of work about some of the main human questions and challenges to be faced in our existence, especially nowadays. In a phrase: I me myself is a kind of musical and conceptual mural about human conflicts. The themes are: our subjection to industries and technologies, the primitive and savage practice of war, the search for a transcendent reality to scape from this dense and disturbing material life, the danger of imposing ideologies and creeds to the others, the slavery to the unreal sense of time that modern societies inflict on our daily lives, the deep feeling of existential loneliness, and our responsibility toward the future in searching for a better world. These are the ruling subjects of the album. Carl Sagan, in his book and TV serial Cosmos asked the question -Who speaks for Earth? Sagan warned us about the danger we face in our human and technologic adolescence. Maybe this album is our -Who speaks for Earth? Present and future is in our hands. If I had to describe quickly The Lamplighter I would say that, it is an album full of inspired melodies and grand symphonic moments, with two suites and one epilogue which can easily remain you about some of the symphonic poems, ballets and programmatic symphonies written in the late 19th and early 20th centuries which were based on folk stories and fairy tales. It is an album musically influenced by Tchaikovsky, Falla, Stravinsky, Grieg, Debussy and Holst and some of the most influential symphonic rock bands of the 70s. It was released in a moment in which the union of all these peculiar characteristics seemed to be old-fashioned. Maybe the most interesting fact about The Lamplighter, since its released in 2013, is that most of its songs were basically composed a long time ago, specifically around the period 1994 – 1998. At that time, that original material was conceived to be played by a band and a symphonic orchestra together. Initially, the idea was a long prog rock symphonic work which would be intertwined in different movements. After finishing The Way tour, the band had the opportunity to record new songs in the Netherlands during the European tour of 2012. That was the moment in which the band decided to rescue some of the original material written in the 90s (Tales form endless star suite) and finally set it using integrally the sonority of Anima Mundi to recreate the atmosphere as if our band and a symphonic orchestra were playing together. So, we built The Lamplighter with carefully planned arrangements and lot of imagination so that we could reach the perspective of an album in the purely symphonic rock tradition, I mean: band and orchestra sounding together. For the final composition and production, we added three new songs to the first suite and a totally new song to be used as an epilogue. We were quite aware that these new compositions should be almost alike in flavor and style to the previous ones. The suite The Lamplighter was composed almost entirely in major tones in contrast to the original Suite Tales From Endless Star that was made mostly in minor ones. We planned a different approach for the epilogue in a more rock and roll contemporary vein with the use of mixed scales and 5th minor chords. The conceptual idea for the album was about the light from its different symbolic meanings, perspectives and senses. The suite The Lamplighter is about the light of our heart, the bright of our consciousness and the shine of empathy. The lamplighter, as a character, was created using the patterns of mythology and fantasy. He is a symbolic representation of our capacity to perceive and understand in the deepest sense. The suite Tales From Endless Star is about our sun and the stars, the light of creation and the meaning of life. Finally, the Epilogue: His Majesty Love talks about the deepest recognition of love as the major force in the universe accepted by many philosophers, mystics and scientists. At the end, we always kept the feeling that we needed more time in the studio to finalize The Lamplighter mixes and production in order to reach the finest product, but it was impossible. It was an album that we had to produce in a very short time. For those who are interested in the Anima Mundi history, The Lamplighter should be appreciated as a representation of the Anima Mundi’ sound in the early days but recorded many years later. A less heavy sound is found in it, with prevailing orchestral arrangements, structured by movements and with the voice of Emmanuel´s deep and anecdotic style playing a narrative roll. All these elements make The Lamplighter a very different album from its predecessor The Way. A lot of music ideas and concepts conceived long time ago but improved with new arrangements and fresh thoughts and sounds. The Dream Child Behind the Mask: Composed in 1998. The original Spanish title was En la Era de Hierro (In the Iron Age). For The Lamplighter album, it was added the coda and recomposed the intro part and first part of the song with changed of tonality and also restructured the solo part different form the original from 1998. Also, new lyrics were added in 2012. Endless Star: Composed from 1994 to 1998. The original Spanish title was Estrella sin fin. The composition was entirely respected just added the psychedelic drum part solo. The Return part 1: Composed in 1998. The original Spanish title was El Regreso. The composition was entirely respected. The Return part 2: Composed in 1998. The lyrics added in 2012 version written in 2011. The composition was entirely respected although we decide to put more dramatic symphonic part at the climax of the song. Light The Lantern Of Your Heart: Its composition started in 1994 and finished between 2006 – 2011. The lyrics were composed between 2010 and 2011. On Earth Beneath The Stars, The Call And Farewell Song, The Human House, His Majesty Love: Are original from 2011 – 2012. Other songs and instrumental parts we used to play in late 90s were finally eliminated when at last the album was retaken in 2012. One more time, in October 2008, we got back to the studios to record a new album. We were sure that it wouldn’t be easy; Cuba is strange place able to make you give up in the smartest adventure, believe me. So, we recovered patience and by means of non stop work; here is, our new musical quest: The Way. This album is placed in the land of the pure symphonic-prog rock although its frontier is not close enough to Jagannath Orbit. Why? Just because The Way is a more lyrical, solemn and dramatic album, dressed of plentiful and constant melodies but also with slow changes of breathing and unexpected soundscapes, but it doesn’t resemble the traditional kaleidoscopic performances or lively arranges appearing in Jagannath Orbit; it is rather an album that takes time to allow us to paint different structures in a tempo, most of times, leisurely and meditative. I have to say that this album was conceived on the idea that it were recorded and arranged pretty close to the real live performance achieving a sound as natural as possible, so entering in the production process, we were all the time very focused in do not cross this line toward a super studio or lab album. It was made with selected material written between 2005 and 2008 and conceived as a whole piece, although the song featuring as independent pieces, where the massage of the human soul ascension into and beyond this world, is the main idea throughout. The Way is an album where the band and the sonority of a symphonic orchestra travel together from the beginning to the end. Because we can’t record with a real symphonic orchestra, the band achieve the orchestral colors thanks to the use of synth and samples sounds, the appearance of guest musicians Mónica Acosta on bassoon, Yailín Martínez on flute and the Anima Mundi family member, Javier Mauri on percussion, united to the use of the concert hall ambient and first of all the purely symphonic of its compositions. 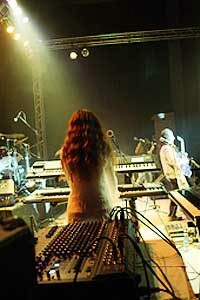 Echoes of Stravinsky, Prokofiev, Debussy, Holst, Tchaikovsky, Falla, Bach will be found throughout the album linked to the influence of Yes, Genesis, E.L.P, Pink Floyd, Rick Wakeman, the late Beatles and the classic sonorities of colourful Mellotron, Hammond organ, modern synthesizers and more. The listener will taste also a cocktail of classical, folk 12 stringed and electric guitars joined to driving bass lines that quite matched with the effectiveness on drums and percussion together with touching melodic and lyrical vocal parts. Although with no doubt The Way is an album of our times, it was created so that it could bring back the spirit of the seventies to our days, not only to recall the inheritance of the golden age of symphonic-prog bands, but also to conceive the visionary atmosphere and the artistic aura of those times in which, music, in a general sense, evoked bigger resonance with Cosmos, Nature and Human spirituality. With this purpose, it is accompanied with an art work and booklet into the pure 70´vibe full of evocative landscapes and characters that including the lyrics plus the epic tale-suite Spring Knocks On The Door Of Men and more. After several line-up changes in the Anima Mundi history, this album shows the potential that the present line-up can offer after more than 4 years of playing together and standing faithfully for the cause of progressive rock. The Way will be released and distributed by Musea Records. Now, while we are waiting for its release we send our best wishes and greetings to all the people that have helped the Art Rock flag blow freely in the past, present and future skies. Our first CD Septentrión was released by the Italian label Mellow Records in June 2002 obtaining good and excellent reviews of the specialized critic. 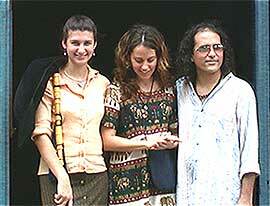 By August of that year, we were ready to record the drums and some percussion of the Jagannath Orbit. We were in a hurry due to the leaving of Ariel Valdés (one of the drummers and pioneers of the band), who would abandon Anima Mundi to travel to Canada, where he would live afterwards. Ariel recorded almost all the tracks of the new album. After Ariel left the country, we were a pretty long time, beyond imagination, looking for a drummer able to play our music and work with us. It is important to keep in mind that this is a land of son, mulatas, tobacco and guaguancó, and with lack of culture regarding progressive rock. Ariel Ángel, our bass guitar player for more than three years, also left the band to play Cuban traditional music. We were, by that time, almost running out of musicians. After a while, we finished the record of the demo of Jagannath Orbit, with a final result that we did not like at all. However, it meant an idea of what could become a great production. I recorded the vocals in Spanish although we had some of the lyrics in English, which would wait until finishing the album. I also recorded the acoustic, electric and bass guitars. At the beginning, the idea was to show the new songs on broadcastings or TV, waiting for the opportunity to remake Jagannath Orbit better. We had to wait three years to retake the work. We bought some necessary equipment so that we could record and mix the album by our own at home, with many details that we will tell later. By that time, the band acquired new musicians, Yaroski Corredera (Yaro) on the bass guitar, Carlos Sosa as lead vocal and Osvaldo Vieites on the drums. With them, the Jagannath Orbit got completed; all the guitars were recorded again, as well as some drums, bass, overdubs of keys, the vocals in English, new arrangements and finally we ended the mix in May 2007!!! All the recordings and mixes were made at home by Virginia during our little free time for more than two years. It is important to highlight that Anaisy Gómez, our bagpipe player, left for Spain, and with the new mix we decided to leave the bagpipe sound out. Similarly to Septentrión, I produced the album. Probably, Jagannath Orbit is the album that has taken more time to be made in history, do we have the Guinness? I can say for sure that our desires were others because we have got plenty of music to be recorded and the band is actually playing nowadays. There is a big dichotomy between our artistic world and the material reality that surrounds us here; however, this is not part of this chapter. Septentrión means the magnetic north, the guide, the light, the way. The album was completely conceived with the idea of showing that attempt of search of the ultimate truth, unmovable an eternal. It was a concept album from beginning to end. Every song talked about an attitude towards us indispensable on that path called Life. As I told before, our history has redounded in the fact of seeing too much musical material accumulated without the possibility of recording it. Septentrión fused the folk and epic repertory. Since late 1997, we already had a big amount of the album music, and in 1999, we did need the sound of the bagpipes which we obtained through two outstanding players: Regis Rodríguez and Anaisy Gómez. They accompanied us in the emblematic song Las Praderas Del Corazón. After giving several concerts, the public that followed our music liked so much the resulting sound that we decided to leave the bagpipes, tin whistle and recorder, as well as some clarinet interventions in the classical sonority of the band. All the songs were arranged with that sonorous hybrid, and it wasn’t possible to start recording ‘till late 2000. We finished the record in June 2001. Many people wouldn’t believe the way in which we dealt with the recording sessions. Cuba is a poor country; besides rock music is not supported here and the public that go to the shows is quite limited. Though it could seem impossible, we didn’t have access to the required equipment and technology, that’s why we had to make this CD in a small room, with the help of an old Pentium 2, except for the drums that were recorded in an antique radio studio to get a stereo mix. Nevertheless, we felt very happy with the product. It was an album made with love and hope. Nimbo project came to reality as soon as Anima Mundi quit the sonority of bagpipes, flutes and the Celtic air in order to remember the sound of Septentrión. Anaisy Gómez had some compositions and melodies influenced by the traditional and Galician music due to her studies at the Galician societies in Havana City. Then, Virginia suggested her to make some arrangements, principally regarding the percussion sequence and orchestrations. Afterwards, the new arrangements were taken into consideration, and they certainly had influence of the symphonic, the New Age, and some elements of rock and Cuban rhythms, always maintaining their Celtic airs. Later, Roberto Díaz joined the band and offered his unmistakable sonority. In this way Nimbo appeared, as a project of instrumental music that quickly called the attention of plenty of people. The band had the support and promotion of the Fantastic Art and Literature Project: Onírica and they were also helped by Baya de Oro club. Both clubs were associated to the University of Havana and were mostly made up of students from this center. During its short period of life, Nimbo was able to give a lot of concerts in several provinces of the country, principally here in the capital. The broadcast on radio and TV was also wide and of a great spread. Even though the band life was ephemeral due to the band leader Anaisy Gómez travel to Spain, where she lives nowadays, the project left an EP called Sobre las Brumas.